Stop your pond water from turning green using this Little Giant 18 Watt Premium Ultraviolet Clarifier. Adding an ultraviolet clarifier to your pond system eradicates algae and pathogens in the water, for fantastic clarity and a balanced environment. 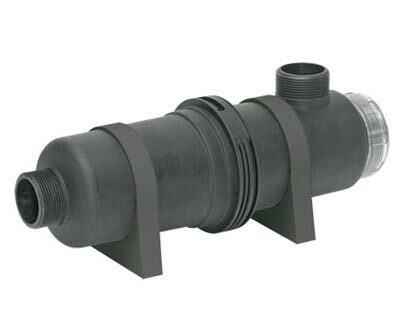 This unit rests inline next to your skimmer, and is rated for use with 1,000 gph or smaller pumps. A clear cap on one end allows you to view the light from a distance, ensuring the ballast is functioning properly. Included 1" and 1.5" barbed fittings help connect tubing to the inlet and outlet of the item, directing water perfectly along the robust bulb. A quartz sleeve protects the bulb from water, and when run continuously, the bulb has an effective lifespan of approximately 6,000 hours, which is a full pond season. Replace the bulb seasonally to ensure the unit remains in working order, and use the included brackets to place the clarifier on a level surface outside your medium pond. Help your water feature remain beautiful and clear with this 18 Watt Premium Ultraviolet Clarifier. One year limited warranty. Note: For optimal performance and to eliminate potential damage to the clarifier bulb, be sure to install the quartz sleeve prior to lighting the bulb.